Getting hired is hard. From finding the right position, to getting a call back, to acing the interview – each step presents its own challenge. There is so much advice out there, but who better to listen to than two senior level managers at San Diego companies? Silvia De Dea from ASML and Janet Koenig from Cubic Transportation Systems sat down with Startup San Diego’s Neal Bloom to share their insights into getting hired, and growing your career. In addition to great technical skills, both agree communication is more important now than ever before. Koenig and De Dea go into detail about how you can show off your communication skills, even if you’re an introvert, by properly preparing for your interview. In this enlightening conversation, the pair also discusses how to advance your career, while staying open to new opportunities. Talent… it’s the key to staying competitive. That’s not just sage advice for some would-be performer auditioning for a plum role. It is a truism that applies to both employees and employers alike as they look to remain competitive in the global marketplace. 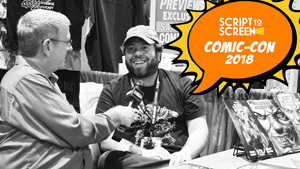 The good news is that San Diego has talent in abundance. In its recent study “Talent: Where San Diego Stands,” the San Diego Regional Economic Development Corporation, led by Mark Cafferty, found that the region added more than 72,000 degree holders in 2014 alone, which was more than any other similar metro area. In addition, San Diego ranked second in the growth of degree-holding millennials when compared to such peer metros as Austin, Denver, San Francisco and San Jose. While that mass of talent is positive for the local economy, it also means that there is plenty of competition when it comes to landing a job. 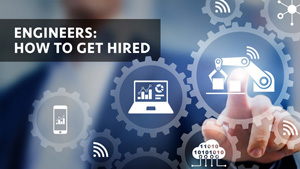 Join Mark Cafferty and UC San Diego Extension’s Director of Research, Josh Shapiro as they detail what skills are most in demand for the fastest-growing careers both in San Diego and around the nation. Also, see how San Diego stacks up in the talent equation compared to other competitive cities and what that means for the economy and your career. 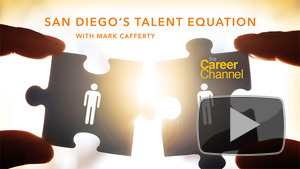 Watch San Diego’s Talent Equation with Mark Cafferty. Over the last 30 years, San Diego’s economy has emerged from a primarily military and defense contracting town into one of the leading innovation regions in America. The term “innovation economy” is often used as an umbrella to capture businesses focused on everything from biotech and environmental applications to defense and wireless communications. They’re also interchangeably referred to as tech companies. Key to San Diego’s innovation economy and identity are the aerospace and communications sectors, creating markets from drones to next-generation wireless communications. Explore the visionary technology igniting these industries and the implications this growth has to further propel San Diego as a leading global city. This program features nationally celebrated journalist James Fallows of The Atlantic magazine and executives from global technology leaders ViaSat, Solar Turbines and the Center for the Advancement of Science in Space (CASIS). 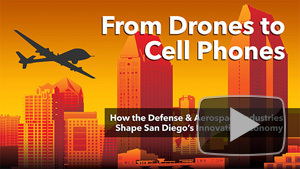 Watch Innovation Crossroads: From Drones to Cell Phones: How the Defense and Aerospace Industries Shape San Diego’s Innovation Economy.